This No Bake Samoa Eclair Cake is easily one of the best on the list! It is the perfect summer treat! 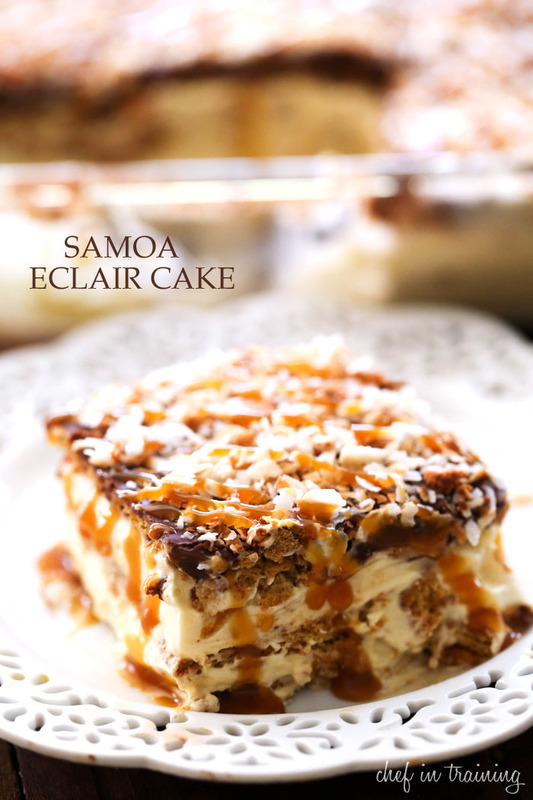 It has layers of creamy heaven and the delicious flavors of “samoa” cookies brought in and enveloped into one of my favorite desserts on the blog already. The two ideas fuse together to bring about one unforgettable dessert! Trust me, it is easy, delicious and doesn’t even require you to turn on the oven! It is a must try! Blend milk and vanilla pudding packets for about 2 minutes. Add caramel ice cream topping and stir. Fold in Cool Whip. Top with toasted coconut and drizzle with caramel sauce. Nikki!! LOVE your recipes and LOVE your photography. I canNOT wait until I am done with my deployment here in SW Asia to go home and *make* some of these delicacies. I must say too, that I pass your recipes on to my dental assistant. We're gonna be Two Bakin' Fools when we go back home!! Would realy love to try the NO BAKE SAMOA ECLAIR CAKE but dont know what some of the ingrediants are as from Great Britain and carnt say iv heard of some of the items needed. Any chance you could give an alternative for items that would be available from GB. HOPE YOU CAN HELP, PAUL. Paul, Graham Crackers are similar to digestive biscuits or vanilla wafers in the UK. Powdered sugar is icing sugar. Hope that helps. What are the ingredients you are unsure of? My jaw dropped when I saw this! My little heart pounds when I see recipes like this one..I just can't help but adore samosa and eclairs in a cake form! Samoas are one of my favorites, so this cake is calling my name! What a brilliant idea! This looks amazing!! But I have Celiac and can't eat wheat -- might have to try GF graham crackers and see if they can hold up. I know the recipe states to refrigerate overnight...what have you found to be the optimal length of fridge time? Thanks! I do not like graham crackers. What could i substitute?? Maybe try Nilla wafers or a cookie of your preference. I made this recipe for a July 4th party and it was a big hit! The only thing I changed was I made my own whipped cream. I'm trying to cut back on high fructose sugar which store bought whip cream does have in it. Home made whip cream is delicious and sooo easy to make. Thank you for posting this. I will be making this again. I know I would love this, but I don't like to use things like Cool Whip and instant pudding. I like to make the real deals. Do you have a recipe for this made from scratch? Can home made whipped cream from the whipping cream be used instead of cool whip, or will it go flat? I do not like the the ingredients that go in the cool whip. Refrigerate overnight? Ha! You've got to be kidding! The only way that might happen is if I were going out of town immediately after putting this in the fridge! One more thing, you only need one box of graham crackers, not two. This dessert is delicious but if you follow the recipe as written you will be very disappointed!! What are some substitutes for the Graham crackers and cool whip, we don’t have those in Australia. Just made - this turned out awesome, but found that only one 14.4 ounce box of Graham Crackers was needed.